As each year passes larger organisations are catching on to how popular League of Legends is, not only that but how popular the League of Legends World Championship is. There was a dramatic increase in betting-sites available for League of Legends from 2014-2015 and this will only increase as we’re heading into the League of Legends World Championship 2016 (LoL Worlds 2016). Some of these websites even hold special betting events where you’ll be able to make a bet on who you think will get first blood, the first team to take a structure or even the first team to take a dragon! 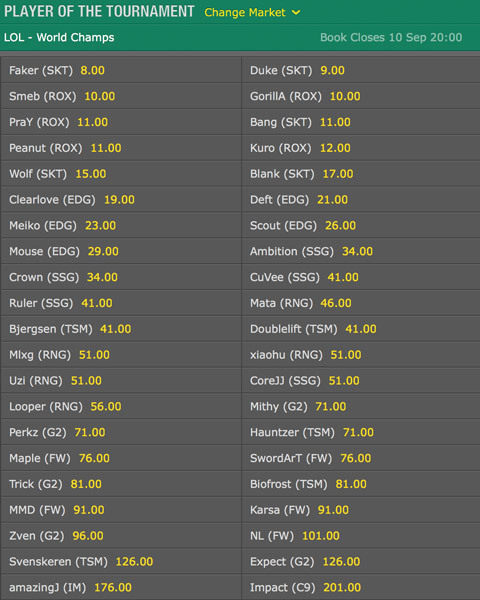 Because of this you’ll be able to increase your odds and earnings for matches if you’re betting smart. 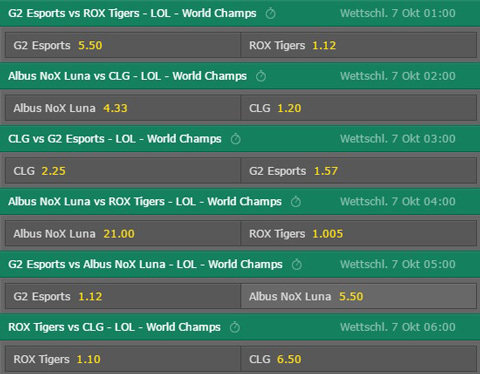 In the section below you’ll be able to find the betting odds for the World Championship games and more once they go live, you’ll have to bear in mind though that because how betting works not all of these websites will be available in your region! This often happens to US residents as their laws surrounding betting are stricter than those in Europe. If you’re encountering trouble whilst setting up your bets feel free to contact the support found on each available website and I’m sure you’ll be able to find a quick solution. On this page you’ll find available betting odds for upcoming matches of the 2016 LoL World Championship tournament, once they become available so make sure you check in regularly for the updates! The next World Championship is coming! These bookmakers are licensed to offer real money betting on League of Legends in most European countries, Canada and South America. While all of these betting sites are offering normal match betting the variety of special bets and the odds themselves may differ from bookmaker to bookmaker. 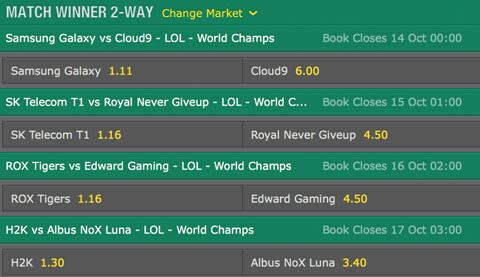 You can take a look at all the betting odds available for the matches of the 2016 LoL World Championship in our preview and prediction articles. 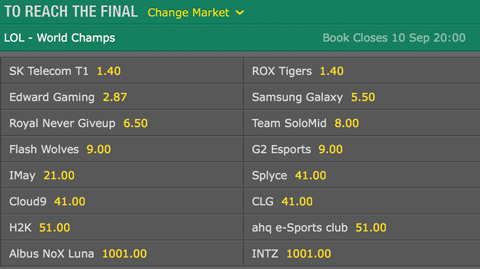 As the World Championship is the biggest League of Legends tournament in 2016 bookmakers are not only offering bets on the matches and the outright/tournament winner of LoL Worlds 2016 but also a broad variety of special bets on in-game events such as which team will slay the first baron, which team will draw frist blood, which team will take the first turret, etc…. We will create a list containing the most common special bets and at which betting site you can find them as soon as the odds go live at the online bookmakers. US players might be familiar to the daily fantasy (e)sports services of Draftkings and others. In daily fantasy sports players are building their own roster from all the teams competing in a tournament. These services are legal in most parts of the United States and Draftkings will have special contests for the 2016 LoL World Championship. We will keep you up to date on any news regarding the DFS contests as soon as more news are available. If you don’t want to play for money or if you are not allowed that’s no problem at all! As the last years Riot offers a free betting game where you can play for your chance to win some nice in-game prizes. 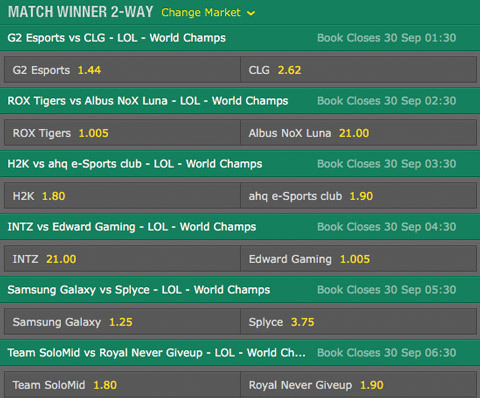 For more information on all free LoL World Championship 2016 betting options check out the Worlds Pick’Em game.